For such a small outlay these headphones give out a very accurate and balanced sound, but we have doubts about their general build quality. We suspect that Sennheiser, pushed to create headphones at a certain price point, have cut back on comfort and strength in the interests of maintaining decent audio quality. The speaker cups are set on rails rather than ball sockets, which means they have a comparatively clipped rotational aspect. True to form, they didn't rest so well on the side of the head. This discomfort is compounded by the headband, which we found grips the head quite tightly, and the inability of the cups to rest naturally against your ears while in their rails was exacerbated by the added pressure. The rail design is also prone to coming loose or breaking over time. Each cup has faux-leather lined pads puffed into ovalshaped raised lips, which cup the ears. In our experience this lining can quite soon become tatty. 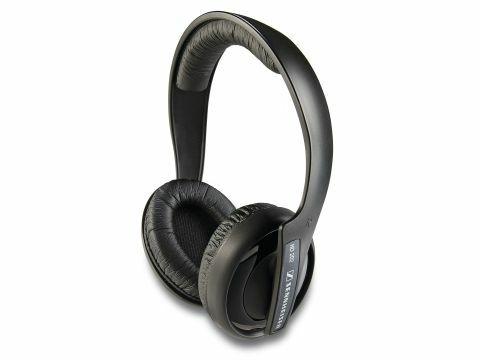 Spending a few pounds more for the HD 435 headphones would pay dividends in terms of lifespan. The leather-like material doesn't let your skin breathe well, either. We could go into more detail about the comfort level of these headphones, but the fact is that the HD 202s are not high-end kit. Their saving grace is their sound reproduction. As a closed set of earphones - a design stage between being open and sealed - most environmental sounds are dampened by the plastic shells. Low-level background sounds such as office airconditioning or engine noise still come through, as there is no noisecancelling feature. For audio playback, the sound quality was fantastic for this price.